I now have seven books to my credit, five in Chinese and two in English. Most recent are Peach Blossom Pavilion (Kensington) and Chinese Children’s Favorite Stories (Tuttle). My books in Chinese include The Art of Qin Music, Guqin Music and Chinese Culture, World of Music, Never Poles Apart (collection of essays), and Good Time on Earth, a book on Zen Buddhism. All have been well received in Hong Kong and three have had Taiwan editions. I even had the ultimate compliment for an Asian writer – one of my books was pirated in China! Click here to see my other books. As a writer and qin musician, I have appeared on 40 TV and radio in Hong Kong, Taiwan, China, and the US, as well as many newspaper interviews. In Hong Kong, I co-hosted with Miss Hong Kong a major English language TV documentary on Chinese opera. In the US, I was featured in a full hour special program on CHN in New Jersey. I have been a columnist for seven major Hong Kong newspapers. My poems have been published and set to music; they have been performed in the Hong Kong Arts Festival and universities in the US. I received my Ph.D. from the University of Paris, Sorbonne, on a full academic scholarship from the French Government. Upon returning to Hong Kong, I held faculty positions at two universities. 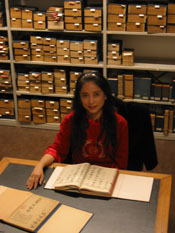 In 2005, I spend two month in the Netherlands as an International Institute of Asian Studies research fellow. 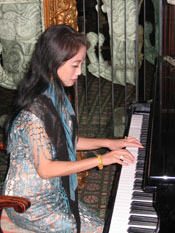 I have lectured and/or performed on music, Buddhism, and Chinese Culture at many institutions including Oxford University, Columbia University, the University of Paris, Amsterdam University, Leiden University, Beijing University, Shanghai Music Conservatory, National Taiwan University, the Cleveland Museum of Art, Oberlin Conservatory, and the China Institute in New York. I have served as consultant for the Chinese Qin Association in Beijing as well as being on the academic board of the Chengdu International Qin Conference. I have also received recognition as a painter and calligrapher. 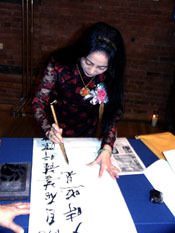 A one-person show of my paintings of Guan Yin (the Chinese Goddess of Compassion) and calligraphy was held at the New York Open Center Gallery in SoHo in 2002. In 1995, I studied Tibetan painting at the Cleveland Institute of Art on a full scholarship. I illustrated my Chinese Children’s Favorite Stories and my book on Zen Buddhism, Good Time on Earth includes my Zen ink paintings and calligraphy. In Hong Kong, I taught calligraphy at Baptist University and I now teach it at the Asian/Asian-American Research Institute of the City University of New York. My works have been collected by scholars and business people. As an enthusiast in Tai chi, I have been teaching the Chinese ancient energy healing at IWWG (International Women’s Writing Guild) since 2004.